By 2002 Iraq's military had modifyied its once standard Soviet-era air-defense systems with newer equipment from a variety of sources. The result was that Iraq's air-defense systems were becoming amalgams of Western, old East European, and Far Eastern technologies that behaved in non-standard ways. That made them less predictable for the US and British planes that were their targets and they became increasingly difficult to counter. Assistance from the Chinese had been forthcoming in terms of laying fiber-optic cables between the various air-defense nodes, particularly in southern Iraq. The purpose behind this is to reduce the electronic emissions given out by the air-defense facilities which, normally, the Americans either would jam or spoof [electronically deceive], or indeed collect intelligence data from. US pilots were less threatened because they had supporting aircraft which were specifically designed to smother surface-to-air-missile radar sites under broad blankets of electronic noise. In addition, the US pilots had the ability to strike the radar sites from tens of kilometers away. In parts of the country, Iraq had deployed some systems to try to jam the satellite-based Global Positioning System (GPS) that NATO members used to help guide missiles to their targets. It is uncertain whether Iraq's GPS jammers were homemade or were smuggled in. By the summer of 1990, Iraq possessed 16,000 radar-guided and heatseeking surface-to-air missiles (SAMs), including the Soviet SA-2, SA-3, SA-6, SA-7, SA-8, SA-9, SA-13, SA-14, and SA-16, and the Franco-German Roland. Additional air defense was provided by Air Force interceptors and organic Army assets, including the SA-7/14, SA-8, SA-9/13, SA-16 missile systems, and the ZSU-23/4 self-propelled AAA system. In addition, the Iraqi air defense had more than 7,500 AAA pieces protecting all targets of value, some deployed on the roofs of numerous buildings in Baghdad housing government facilities. These weapons -- 57-mm and 37-mm AAA pieces, ZSU-23/4 and ZSU-57/2 self-propelled AAA systems, and hundreds of 14.5-mm and 23-mm light antiaircraft weapons -- formed the backbone of the integrated air defense network. In major high value target areas (such as Baghdad, airfields, chemical agent production complexes, and nuclear facilities) the combined arms air defense could prove lethal to aircraft operating below 10,000 feet. The Iraqi air defense system was formidable, combining the best features of several systems. The multi-layered, redundant, computer- controlled air defense network around Baghdad was more dense than that surrounding most Eastern European cities during the Cold War, and several orders of magnitude greater than that which had defended Hanoi during the later stages of the Vietnam War. If permitted to function as designed, the air defense array was capable of effective protection of key targets in Iraq. The UN and Kuwait say Iraq did not return extensive Kuwaiti military equipment, including one Hawk battery and 675 Russian-made surface-to-air missile batteries. 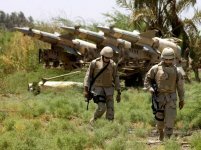 Between December 1998 and February 2000 the United States claims to have have effectively destroyed 30 percent of Saddam's air defense capability across the board - missile systems, triple A [Anti-Aircraft Artillery], radars, command and control, etc.--methodically, precisely, carefully, with minimal if any collateral damage. These claims are apparently not reflected in standard bean counts, which inexplicably suggest that Iraqi air defenses were as much as one-third stronger in 2000 than they were prior to the Gulf War. By 2002 Iraq still maintained an integrated air defense system (IADS) of overlapping rings of surface-to-air missiles around Baghdad and Tikrit. However, in the no-fly zones air defenses consisted of antiaircraft artillery and modified artillery rockets, with occasional surface-to-air missiles moved into unprepared sites for a short time. Command and control in the no-fly zones was rudimentary and decentralized, because the air defenses there have been attacked with regularity over the years. By 2002 Iraq's shoulder-fired, low-altitude missiles were primarily the aging SA-7 and SA-14s. The Iraqis were not thought to have the more sophisticated SA-16s and SA-18s. The primary air defense operations center was in Baghdad, with sector air defense centers in Taji (central), Kirkuk (north), H-3 (west) and Talil (south). These centers control about 60 SAM firing units [variously called batteries or battalions] of SA-2s, SA-3s and SA-6s. At the beginning of Desert Storm, there were 90 such units. According to some estimates there are as many as 7,000-7,500 AAA guns of 23 mm or greater caliber [IISS estimates about 6,000 such guns]. The most numerous AAA guns were reportedly the 57-mm S-60 and the 100-mm KS-19. The radar tracking information for guns inside the no-fly zones was provided from distant radars outside the no-fly zones. Effort by Chinese and other companies to improve this system with fiber-optic data links did not appear to have made a major improvement in Iraq's air defense. As of late 2002 there was no evidence that Iraq had been able to obtain any elements of the SA-10 or SA-20 air defense systems, nor was there any indication of significant upgrades to the SA-2, SA-3 or SA-6 missiles systems. It did not appear that Iraq has imported or made operational any passive detection system, such as the Ukrainian Kolchuga or the Czech Tamara or Trash Drum/Ramona systems.